Dylon Reid Smitherman, age 18, of Selma, went to be with the Lord, Thursday, January 30, 2019. Dylon was a special person with a profound love for our Lord and for other people. He not only sought to love the Lord our God with all of his heart, mind and soul, but he lived out his faith by loving his neighbor as himself. Dylon was baptized as a disciple of Jesus Christ at Elkdale Baptist Church. After moving to Baldwin County and then back to Selma, he joined Barrett Road United Methodist Church where he served as a Communion Steward and sign master. He also served in any capacity where he was needed - delivering food to those who were hungry, hauling garbage off as a neighborly deed, staying up all night smoking BBQ for a church fundraising project or helping someone move. He enjoyed his travels and hikes with his grandfather. They hiked the ridge of the Little River Canyon and also hiked down to the river itself. An especially memorable hike was the one when they hiked down Mt. Cheaha, Alabama’s highest point, in the spring of 2018; they were caught in a storm and forced to hike straight back up in driving hail. This past fall, the hiking fun continued with a hike up and back down Amicalola Falls in Georgia. In styling his life to help people, Dylon became a dedicated life guard and worked at the Grist-Brown YMCA in Selma. He looked upon his work there not just as a job. He saw it as an opportunity to serve and make the aquatics department the best that it could be. He was always eager to help seniors and other to get into the pool and looked out for their wellbeing in every way. In his most recent endeavor to love his neighbor, Dylon turned his attention to firefighting. As a student at Robertsdale High School, his appetite was whetted with his courses in Fire Science, in which he earned several certifications. Most recently, he became a member of the Craig Field Volunteer Fire Department. 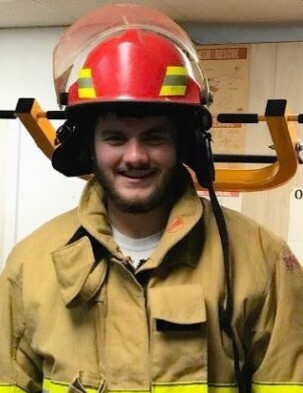 He had recently passed his Alabama CPAT (Candidate Physical Ability Test) course, which consists of eight separate events designed to test the physical ability of those seeking to serve as firefighters. Dylon loved his family in a large way, always looking out for them and their safety. He enjoyed going on trips with family members or just hanging out with them, always making them laugh. His large heart, which continually reached out to others in love, will leave a large empty place in the hearts of his family, his fellow church members, Y workers, and the Craig Field VFD and others who had the opportunity to know him. Services will be held at 2:00 p.m. Sunday, February 3, 2019 at Barrett Road United Methodist Church with Rev. Travis W. Barnes, III and Rev. Cory Horton officiating and Lawrence Brown-Service Funeral Home directing. Burial will follow at Pineview Memory Gardens. Visitation will be Saturday, February 2, 2019 from 5:00 - 7:00 p.m. at Lawrence Brown–Service Funeral Home. Dylon is survived by his mother: Christina Barnes Smitherman; father: David Justin Pouncey; adopted father: Steven Aubrey Smitherman; brothers: Brey Travis Smitherman and Taylor Reid Smitherman; and sister: Elizabeth Morgan Smitherman; grandparents: Travis W. (Rebecca J) Barnes III, David Randall Pouncey; and numerous step brothers and sisters. Pallbearers will be: YMCA Lifeguards: Stephen Flanary, Reid Smitherman, Preston Haskell, Patrick Haskell, Taylor Haskell, Jamie Graham and Walter Newberry, as well has his uncles: Reed Barganier and Colman Love. Honorary pallbearers will be Craig Field Volunteer Fire Department.